1. You haven’t started planning for the summer 2019 interns. Recruitment of interns should commence at least eight months before the desired start date. Recruitment includes campus visits, interviewing and hiring. Your work doesn’t stop after making the hire though. Spring should be spent communicating with the hire (frequently), training staff that will work with interns and preparing the students summer project(s). 2. Your compensation package is outdated. In response to our 2017 Internship Benchmark Survey, 63% of interns reported being paid $16-21.00/hour. Since most interns have more than one legitimate offer to consider it is important that you can compete with the standard industry pay. There are other benefits to consider including in the offer package that will perk the interest of college students such as a gym membership, housing stipend and paid volunteer time. 3. Interns aren’t converting to full-time hires. Conversion rates should be top of mind for the employer. You have already invested considerably in your interns and those that convert to full-time hires are more productive faster. If you don’t have a high rate of conversion you need to examine why interns don’t want to work for your organization full-time. There are likely dominating factors such as company culture, or the interns feeling of whether they contributed to meaningful work. There is much to be considered when building a successful program and AgCareers.com recognizes how critical it is for companies to get it right. While helpful, the three issues highlighted above are just the tip of the iceberg. 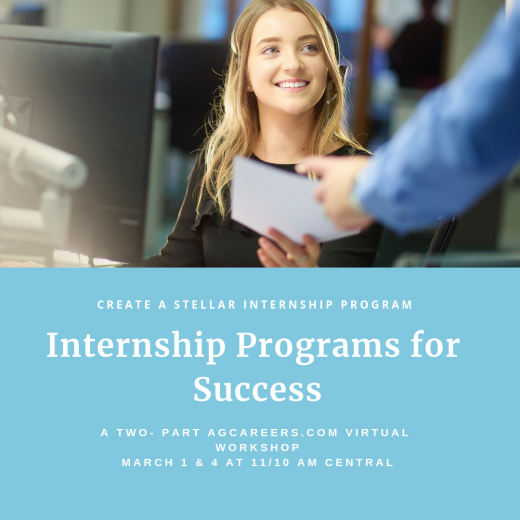 To ensure your internship program is operating effectively join us for Internship Programs for Success- Two Part Virtual Workshop. Part 1, hosted March 1 will focus on the Do’s and Don’ts’ of Successful Internship Programs. This will be followed by Part 2 on March 4, Preparing Managers for a Successful Internship. The stakes are high when it comes to internship programs and it pays to get it right! Register for our virtual workshop today!